While some want to build walls to Mexico, a local Whidbey woman is building bridges. As a followup to our Dec. 29 story in This is Whidbey: Be here now for this sewing bee, women have since gathered on Friday afternoons to stuff, sew, crochet, and embroider life-sized newborn dolls for a teaching project in Chiapas, Mexico. 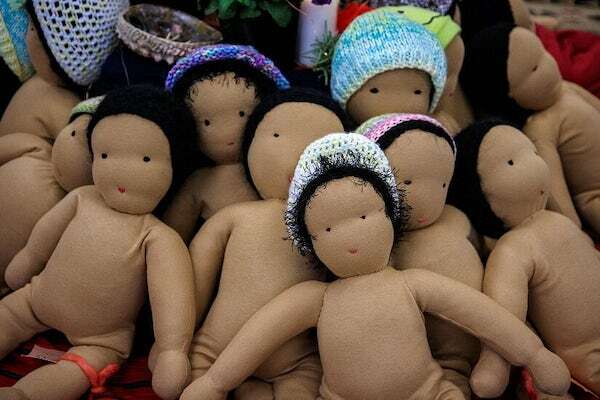 From Jan. 5 to Feb. 1, the dolls took form, culminating in a blessing of lullabies and celebration with visiting volunteers from Compañeros ed Salud. At the sewing bees, held at Create Space Langley, one found juicy women in a creative frenzy, sharing their stories, skills and bonhomie. Gretchen Lawlor and long-time friend Anne Zontine celebrate the making of 39 dolls. Challenged to fulfill a promise made, Gretchen Lawlor, with a lot of help from friends, succeeded in making 39 dolls for rural Mexican teachers of women’s health. Artist/astrologer Lawlor started the wheel turning last summer. “It began when I met a group of rural Mayan midwives gathered in a small town in the Sierra Madre mountains of Chiapas,” Lawlor wrote in an email. ”I was there caring for my grandnephew Luca while my niece Jessie and her husband Adrian volunteered as doctors in a local center of Mexican Compañeros en Salud (Partners in Health). “Eighteen-month-old Luca and I often went for lunch at the office of Compañeros en Salud, and had a chance to sit with young Latin doctors and nurses and hear about their work. 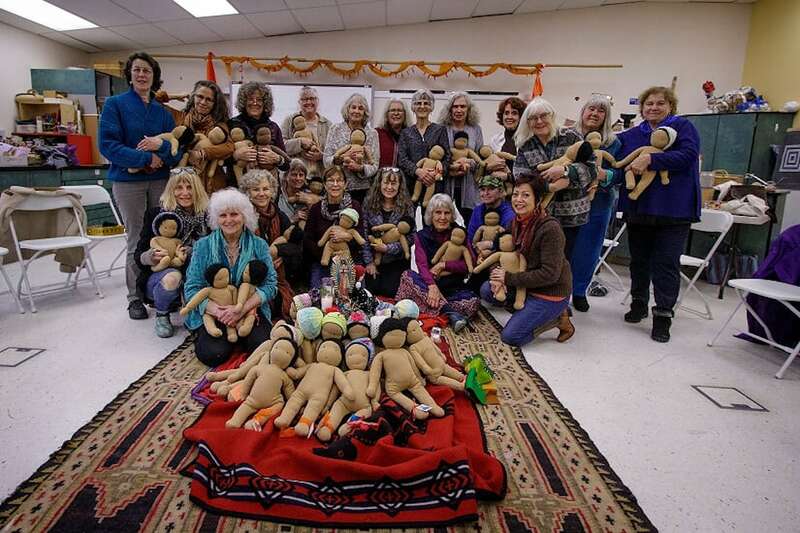 One day community education specialist Paula Samuelsen mentioned wishing she had more dolls for a convocatorio (gathering) of midwives happening that weekend. I looked at the dolls and told her I figured I could make a couple more. Luca and I went in search of the materials–finding a cocoa-colored t-shirt in the used clothes market, a pillow full of stuffing, needle and thread and scissors. And when Luca napped or slept, I figured out a pattern, then stuffed and sewed them up by hand—all from memories of making Waldorf dolls when (my children) Aubrey and Morgana were young, here on Whidbey with my friends. “Ah, those midwives, they are a whole story in themselves. At the gathering I watched their hands, wise from handling babies for so many years, tenderly handling the dolls as they shared techniques with each other and with the new young doctors and nurses. Their wrinkled flat feet in dusty old sandals. Each woman carefully tucking away every memento of the day in their bags as they prepared for the long journeys back to their communities. Assuring Paula Samuelsen she was going to get 38 dolls made, Lawlor returned to Whidbey and began to make good on her promise. The Jan. 5 gathering for the public was preceded by months of conversation and getting the project organized. 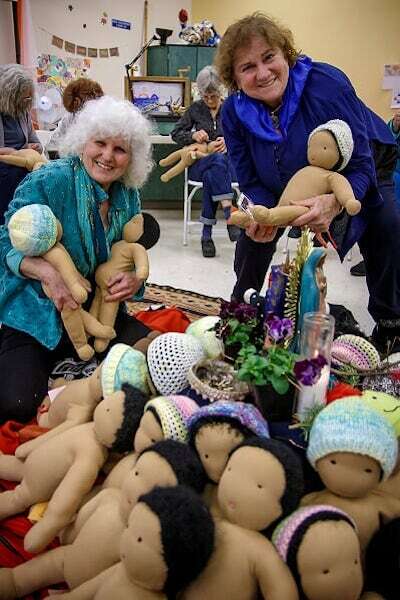 The original Dolly Mama, Anne Zontine’s patience and skill added to the success of the Co-Madre doll making project. Co-Madres are the Chiapas-area teachers. It took time to figure out how they were going to do it. 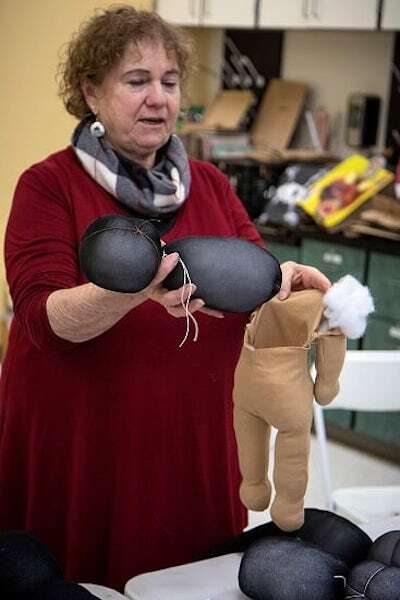 Long-time friends of Lawlor’s: Zontine, Penny Cabot and Autumn Preble were soon joined by Ronlyn Schwartz and Heidi Jefferson-Gloor, and even more women soon followed to design the dolls, gather the materials, offering willing hands to make them. 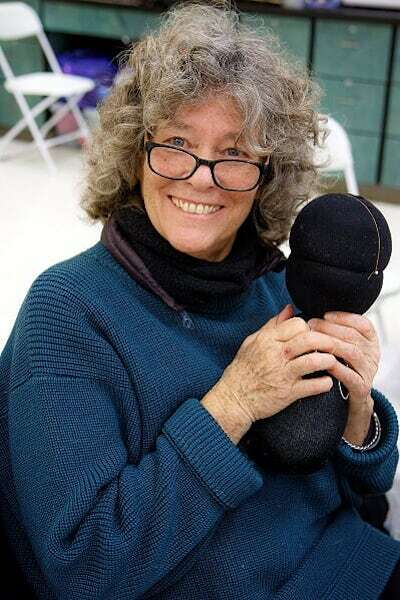 To ensure flow in the month-long public sewing bee Zontine led the design process, looking to make a realistic life-sized doll with simple steps for volunteers with different skill levels. The doll-making materials needed to be inexpensive or donated, and resistant to the humid damp in the small communities where the dolls would be handled by the healthcare workers, young mothers and their families. They scoured second-hand stores, made prototypes, tried different materials, and fine-tuned proportions of heads to bodies to approximate the size of an average newborn to six-month-old Mexican infant. “The process was fun because we did it together,” Lawlor said. “We eventually figured out that a man’s sock stuffed with soft fleece from clean used clothing or baby blankets made a great core head and body, which was then wrapped in stuffing. Everyone was on the lookout for bags of polyster/quilting stuffing that frequently showed up at the local second-hand stores. Knitters donated yarn to make hair, Paula Samuelsen found a friend willing to donate money for the yards of light cocoa-colored fabric we needed to match the skin of tiny Mexican babies. Autumn Preble, one of Lawlor’s long-time friends, jumped on board to make dolls for rural teachers. The project was launched for the public on January 5 with a whole day-long open sewing bee at Create Space. 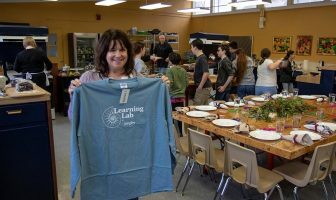 Lawlor’s invitations to many friends made over more than 30 years of living on Whidbey brought women from many different parts of the Whidbey community together. “Forty women showed up for that first day!” Lawlor added. “We followed that meeting on Fridays from 3-5:30 at open sewing bees, eventually involving over 70 women. 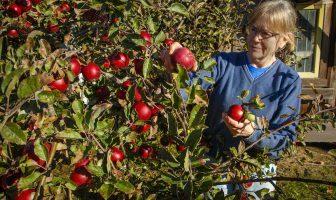 It’s true that there were also hours and hours of behind-the-scenes work, fine tuning, repairing, redesigning, especially at Anne’s warm house in the Maxwelton Valley where she or her husband Don effortlessly and miraculously cooked us meals. Even their grandchildren became part of the project, sewing little dolls, blankets and pillows. “Early on we realized the dolls needed to be completed in time to emerge by Candlemas, the first stirrings of spring, on Feb 1st. Everything we did seemed to have its own sense of perfect timing, thankfully as the hope of completing 38 detailed well-made dolls in such a short time was going to require a few miracles. “During the month 15-25 women showed up every week; there were always new faces, curious to experience the buzzing excitement of this creative community,” Lawlor added. “We had invited anyone and everyone, and the swarming enthusiastic women dominated the atmosphere. We sat around a huge table (made of two, then expanding out three banquet tables). We always made a point in our invitations of letting people know they didn’t need sewing skills to participate. We had cutters and crocheters and stuffers and those who hadn’t taken up a needle in many years embroidering eyes and mouths. They learned by sitting next to someone who knew what they were doing. Everything was passed on experientially, we all found our place, passing on what we knew, in a living lineage. Eventually we got quite specific, with tape measures and sample models and Annie as quality control checking the firmness of heads, reminding us it was our own child self we were tending with our hands. Finally, all 38, and one more, were completed in time to celebrate Candlemas. Paula Samuelsen and another Compañeros en Salud friend Scarlet Huber arrived from Chico, California for the celebration. Gathered at the foot of a statue of Guadalupe, the Mother of Mexico, the dolls, each one with its own personality, made a moving tribute to the women’s work. A laminated photo of each Mexican Co-Madre recipient was tied by ribbon to each dolls’ ankle. 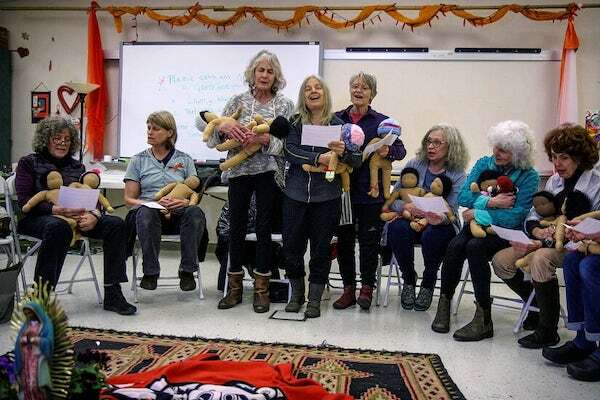 As a blessing to the dolls and their future teachers, Lawlor asked the circle of women to hold the dolls they made, stand up and sing a lullaby or tell a story about their own experience as a mother, auntie or grandmother. That was followed by a blessing ceremony Lawlor learned while living in Mexico. Each woman was asked to kiss the head of the doll to her right and then her left. What followed was a wave of blessing/nurturing that traveled around the circle. It was heartfelt and powerful to be part of the group. Afterwards friends Samuelsen and Huber returned home with one of the dolls secured in a womb-colored drawstring bag. But the dolls are not going to Mexico yet. Meanwhile, the original TIW story will be translated by Mrs. Jenny Gochanour’s high school Spanish class at South Whidbey High School so the story about the co-madres (“co-mothers “) here on Whidbey making the dolls could be shared with their Mexican recipients. For more information, contact Gretchen Lawlor. An uplifting story, told in the detail it deserves. Photos by David are terrific and convey, as does the text, a sense of the joy and camaraderie shared by the doll makers. Thank you both for helping readers see that Love and Stitchery may just save the world! This is fabulous. Had I been on island during January, I’d have loved being there to help! Glad you liked this story. It really opened my heart to do it. Beautiful women with beautiful hearts and a beautiful purpose!! Hey Liz, thanks for writing. Truly a heartfelt experience. Love this story! It reminds me of my Peace Corps experiences in the late 70’s at a rural health unit. They also gathered all the midwives for training and I was so impressed with their wisdom, strength and love. Yay! Glad you like it, Bridget. It was a powerful experience to write it and be a part of this. Such a wonderful sisterhood project! Great job, everyone. Kate (& David’s photos) really did Gretchen and the Co-Madres project justice with such a soul-filled article! I know Gretchen from her 4 yrs in central Mexico, you captured her same generous spirit, endless energy and creativity which she shared in abundance with our Mexican town’s local schools. LOVED reading all about the Woman of Whidbey’s unity and commitment, along with my dear friend Gretchen’s latest inspiration to help ‘make the world a better place’ no matter where she is. We sure miss her down here in Mexico but so encouraged you all are appreciating her up there! Thank you so much for writing and recording this wonderful project. Great article.